These ingots are 5lb (pounds) each. 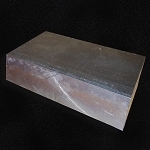 This 40 to 1 alloy features forty parts of lead and one part of tin (97.5% lead, 2.5% tin). This alloy is great for many black powder cartridges and is known for its excellent expansion and weight retention. Price listed is per pound and they are sold by the pound in 5 pound increments.